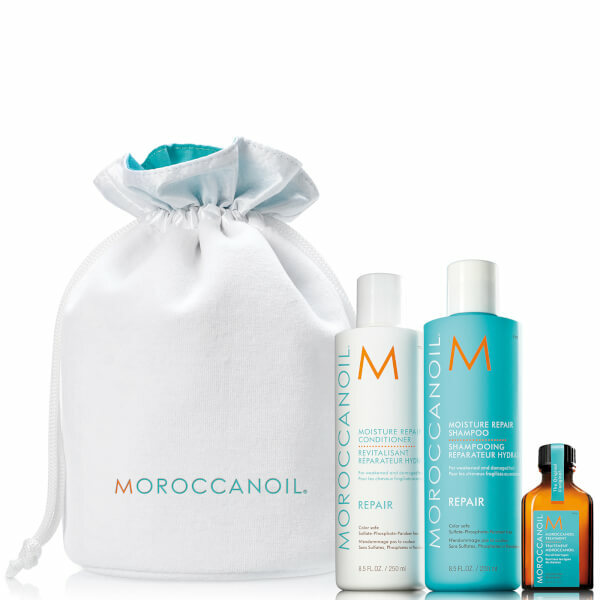 Treat your locks to the hydration-boosting and reparative benefits of the Beauty in Bloom Set - Moisture Repair from Moroccanoil. Housed in a white drawstring bag, the haircare kit combines the brand’s award-winning treatment with a moisturising shampoo and conditioner duo that leaves locks silky-smooth, manageable and super-shiny. Colour-safe. Sulphate-free, phosphate-free and paraben-free. A luxurious shampoo formulated to gently cleanse hair whilst restoring elasticity. Its Keratin-rich formula provides essential fatty acids to strengthen the hair's structure and intensely moisturises locks for a healthy shine. Enriched with Argan Oil to leave hair feeling smooth and soft. A lightweight formula with a high concentration of Keratin and fatty acids to rebuild strength and enhance moisture levels, leaving hair manageable and calm. Argan Oil works as an antioxidant to protect hair from colouring, chemical processing and heat styling. Harnessing the powers of antioxidant-rich Argan Oil and shine-enhancing vitamins, the nourishing leave-in treatment helps to strengthen and fortify strands, whilst fighting frizz and effectively detangling for a salon-worthy finish. Expect calm, manageable locks with revived radiance and vitality. Ideal for dry, damaged hair. Shampoo: Massage throughout wet hair and scalp. Continue to add water to activate a rich lather. Rinse thoroughly until water runs clear. Repeat if needed. Conditioner: After shampooing, squeeze excess water and apply from mid-length to ends. Leave on for 1-2 minutes and rinse well. Shampoo: Aqua/ Water/Eau, Sodium Lauroyl Sarcosinate, Disodium Laureth Sulfosuccinate, Cocamidopropyl Hydroxysultaine, Cocamide Mea, Sodium Lauryl Sulfoacetate, Glycol Distearate, Dimethicone, Argania Spinosa (Argan) Kernel Oil, Persea Gratissima (Avocado) Oil, Chamomilla Recutita (Matricaria) Flower Extract, Lavandula Angustifolia (Lavender) Flower Extract, Rosmarinus Officinalis (Rosemary) Leaf Extract, Simmondsia Chinensis (Jojoba) Seed Extract, Hydrolyzed Vegetable Protein Pg-Propyl Silanetriol, Silk Amino Acids, Hydrolyzed Keratin, Keratin Amino Acids, Citric Acid, C12-13 Pareth-23, C12-13 Pareth-3, Trideceth-12, Divinyldimethicone/Dimethicone Copolymer, Polyquaternium-7, Polyquaternium-10, Quaternium-80, Peg-150 Pentaerythrityl Tetrastearate, Amodimethicone, Dimethiconol, Peg-6 Caprylic/Capric Glycerides, Panthenol, Cyclopentasiloxane, Sodium Lauroyl Lactylate, Sodium Pca, Sodium Acetate, Propylene Glycol, Caprylyl Glycol, Cinnamidopropyltrimonium Chloride, Isopropyl Alcohol, Tetrasodium Edta, Disodium Edta, Cetrimonium Chloride, Chlorphenesin, Phenoxyethanol, Sodium Benzoate, Potassium Sorbate, Ci 19140 (Yellow 5), Ci 17200 (Red 33), Alpha-Isomethyl Ionone, Hydroxyisohexyl 3-Cyclohexene Carboxaldehyde, Linalool, Butylphenyl Methylpropional, Parfum/Fragrance/Aroma. Conditioner: Aqua/Water/Eau, Behentrimonium Chloride, Cetearyl Alcohol, Stearamidopropyl Dimethylamine, PPG-3 Benzyl Ether Myristate, PEG-40 Castor Oil, Glycerin, Cetrimonium Chloride, Hydrolyzed Vegetable Protein PG-Propyl Silanetriol, Argania Spinosa (ARGAN) Kernel Oil, Simmondsia Chinensis (Jojoba) Seed Oil, Persea Gratissima (Avocado) Oil, Keratin Amino Acids, Hydrolyzed Keratin, Sodium PCA, Silk Amino Acids, Rosmarinus Officinalis (Rosemary) Leaf Extract, Lavandula Angustifolia (Lavender) Flower Extract, Chamomilla Recutita (Matricaria) Flower Extract, Amodimethicone, Trideceth-12, C11-15 Pareth-7, Laureth-9, Panthenol, Isopropyl Alcohol, Propylene Glycol Dicaprylate/Dicaprate, PPG-1 Trideceth-6, Hydroxypropyl Guar Hydroxypropyltrimonium Chloride, Polyquaternium-37, Propylene Glycol, Cinnamidopropyltrimonium Chloride, Disodium EDTA, Fragrance (Parfum), Phenoxyethanol, Ethylhexylglycerin, Citric Acid, Yellow 5 (CI 19140), Red 33 (CI 17200), Butylphenyl Methylpropional, Hydroxyisohexyl 3-Cyclohexene Carboxaldehyde, Linalool, Alpha-Isomethyl Ionone.